Here's a little bit of history required to understand the available options for debugging D programs with Visual Studio. If you are only interested in the latest state with VS 2015, you can skip all this and go directly to the recommendation. 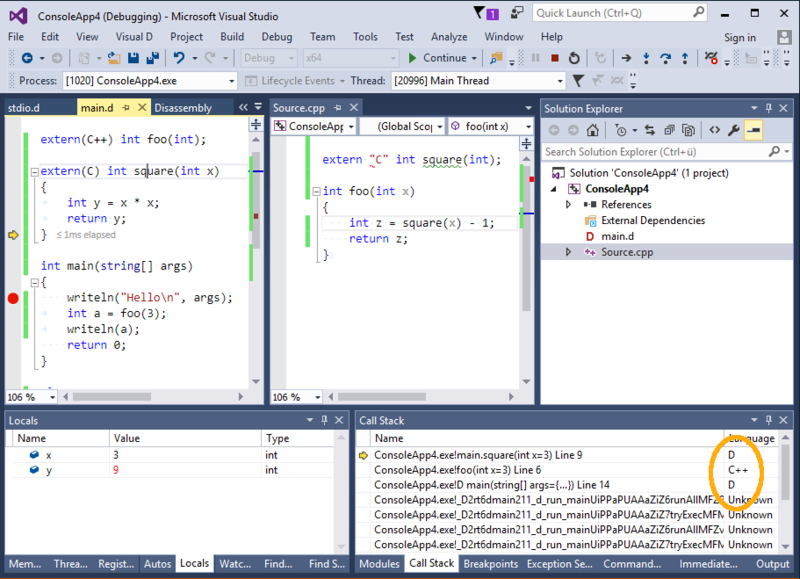 Development of Visual D started around 2009, with VS 2008 being the latest Visual Studio version. DMD only supported Windows 32-bit programs, with debug information written in an ancient version of CodeView. This was not well understood by the Visual Studio debugger, basic operations like setting breakpoints and investigating struct members didn't work. That's why cv2pdb was created to convert the old CodeView debug information embedded into the executable to a newer version of CodeView written into a PDB file. VS 2008 and VS 2010 have two engines for debugging native code, one mainly targeted at C/C++ and one for mixed native and managed code. Both understood visualizer descriptions in a file named autoexp.dat, that cv2pdb took advantage of to display some D constructs in watch windows: slices, strings and associatives arrays. That made debugging D programs quite possible, though debug info from the compiler was very basic. Some quirks had to be accepted, e.g. type names must not contain '.' to avoid confusing the debugger, so it is replaced with '@'. Expressions need to be specified in C/C++ syntax. In 2010, Aldo Nunez surprised the D community with a new debug engine dedicated to the D language, that plugs in to Visual Studio as an extension. This engine can read the old CodeView debug information emitted by DMD. Having full support for D types and expressions, the above quirks are avoided. In addition, there is no need to supply slow visualizer macros as mago can display slices, strings and more nicely. 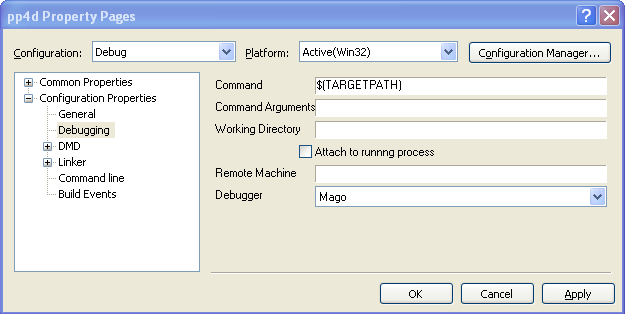 You can select the mago debug engine in the project debugging settings of a Visual D project. One downside of the mago debug engine is that it does not support all the features of the native Visual Studio debugger, e.g. conditional breakpoints, hardware assisted breakpoints or attaching to a process. 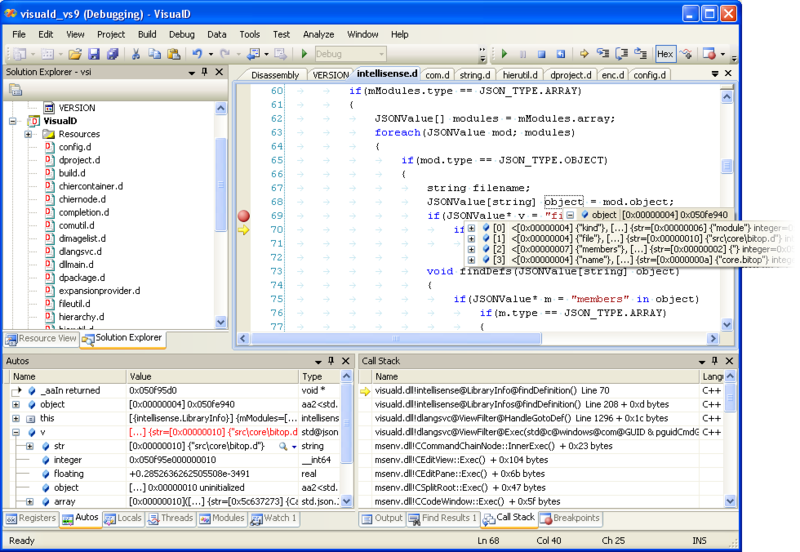 DMD added 64-bit Windows support in 2012, writing COFF object files supporting the newer version of the CodeView debug information from the start. So there is no need to use a conversion tool for its output. In 2014, DMD got the option to also emit COFF files for 32-bit code using the same debug format. The visual studio debuggers obviously had 64-bit support, and mago followed suite in 2014 including support for the PDB debug info format. Starting with Visual Studio 2012, Microsoft introduced a new debugger that replaced the native debug engine. Unfortunately, it had some incompatibilites with the preceding debug engine. This includes displaying D variables in the Watch Window and interpretation of the visualizer macros in autoexp.dat. The new engine has extended visualizer capabilities, but these are targeted to C/C++ and don't work well with D syntax. You can switch back to the old debug engine by going to Tools->Options and then under the debugger settings, turn on native edit and continue. This is a global setting and will also affect your C++ projects, though. Mago is uneffected by this change. The VS 2013 debugger engine fixed some of the problems with displaying local variables. With the next version of the debug engine supporting "native edit and continue", the fallback to the old debug engine no longer works in VS 2015. Instead Microsoft released information about the extensibility of this debug engine (introduced with VS2012) called Concord, late in 2015. It consists of more modular components than older engines. This allows taking advantage of most features of the debug engine by just replacing language specific parts, i.e. the expression evaluator. In addition, debugging mixed languages is no problem anymore. The debugger engine needs to detect the source language of the code location. This information is added to the debug information starting with dmd 2.072 when compiled for COFF object files (-m64 or -m32mscoff) with -g, but not with -gc, i.e. you should select debug info for Mago even when using the VS debug engine. Unfortunately, LDC does not yet emit this source language information. If you are using the new Visual C/C++ project integration, all you have to do is select debug information "for D debug engines" on the project configuration page "D Compiler->Code generation". As of version 0.3.21, the installer adds an entry "D Exception" to the list of Win32 exceptions that can be found in the Debug->Exceptions dialog. This allows the debugger to stop execution when an exception is thrown by the debuggee. With earlier versions, you'll have to add an entry with code 0xE0440001 yourself. Please note that these specific exception settings only apply to the Mago debug engine, not the Concord extension.